The “Steel Top”, has established itself in a whole range of applications to be the leader in quality and performance standards. Built to Last – All steel deep-drawn power head provides a structure of exceptional strength. Noise Reduction – Patented Microtec noise reduction system. Professional and Powerful – Longlife professional TwinFlo motor. HepaFlo – Easy to change high efficiency HepaFlo bags. TriTex Filtration System – Improve filtration, cleanliness and capacity. Nucable System – Quick and simple cable replacement, saving on expensive repairs due to damaged cables. Professional Accessory Kit – Accessory kit AS1 incorporates a stainless steel tube set. High Efficiency Motor – Numatic high efficiency long-life motor. 10 Metre Cable – Easy reach, 10 metre cable. TriTex Filtration System – Improves filtration, cleanliness and capacity. Wand Docking – Convenient, on-board wand docking storage. HepaFlo – Easy to change HepaFlo bags. Professional Accessory Set – A tool for every job, full accessory kit AH0 with aluminium tube set. A Class – Energy efficient, A rated. 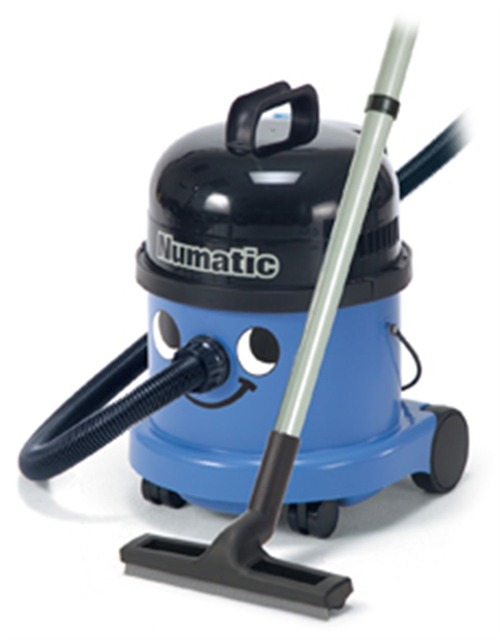 The practical features of the RSV (Ruc Sac Vac) bring with it great advances in convenience cleaning, producing vastly improved results by virtue of the old adage “the right machine for the right job”. 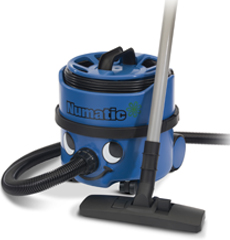 In many countries Ruc Sac cleaning has become commonplace with substantial improvements in cost effective operation. Particular attention has been paid to user comfort, convenience and safety with an ergonomically designed, comfortable harness system; lighter weight and lower noise levels. 230 V AC 50/60 Hz. 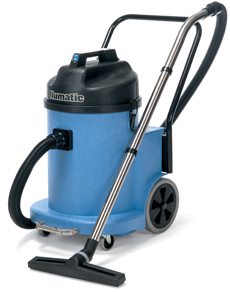 The WV-370’s are, by design, wet or dry vacuum cleaners that perform totally without compromise in either mode. When operated as a dry machine performance is as good as a dry-only machine, with big filters and the option of giant Hepaflo disposable dust bags ensuring a high standard of operation. Similarly, when required for wet work, a quick switch of the dry filter for the wet float valve and a change of floor nozzle will give you equally professional performance and a clean, dry floor at the end of it all. The machine is to our full Twinflo’ performance specification ensuring exceptional results. Wet or Dry – Professional results in either mode, accessories provided for both wet and dry use. Compact – Easy to store compact design, always close to hand when needed. On the Move – Lightweight and with ergonomic easy carry handle…perfect for multi-site applications. 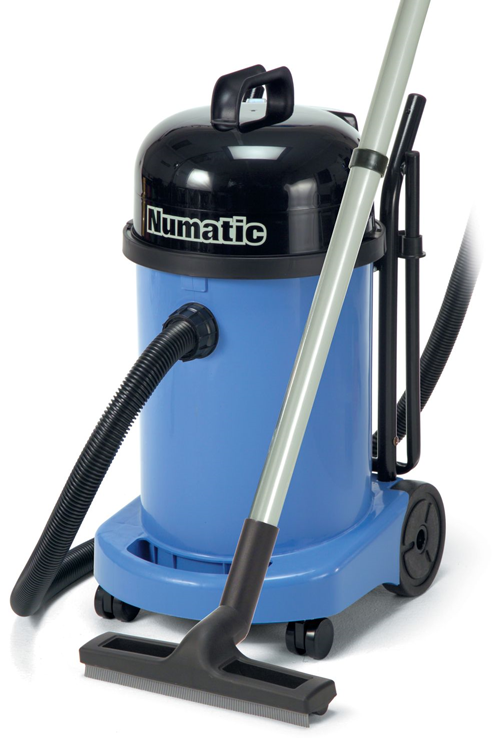 Easy Emptying – Fitted with easy empty handle providing simple and clean emptying. The WV-470 provides a larger alternative to the 370-380 series, with twice the capacity but to the same high performance standard be it wet or dry. The accessory kit provides tools for both wet and dry operation with stainless steel tube sets as standard. Wet or Dry – Professional results in either mode. Accessories provided for both wet and dry use. 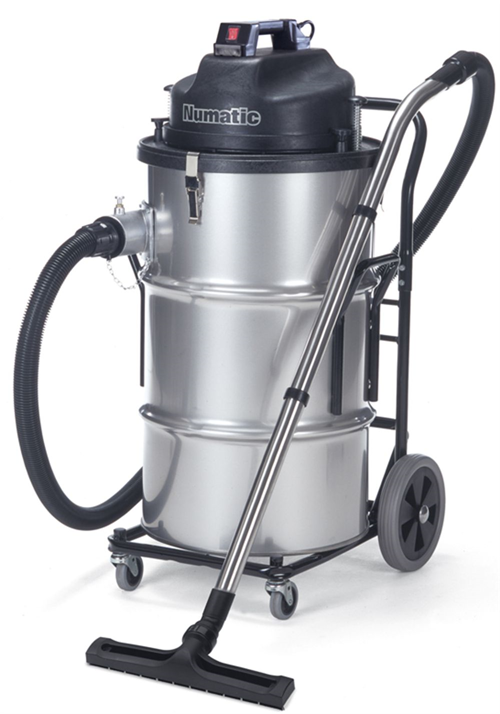 Compact & Capable – Compact with a small foot-print the 470 provides an impressive 20L Wet / 27L Dry capacity. Folding Handle – The transit handle makes life easy when you need it and folds away when you don’t… simple! On the Move – Not everywhere will be flat and smooth, large rear wheels and directional castors make transporting the 470 easy, even when full. Wet or Dry – Professional results in either mode, professional accessories provided for both wet and dry use. Structofoam Construction – Heavy duty Structofoam used in both head and body construction. Nucable System – Power cable can be replaced without the need for an electrical engineer. Easy Emptying – Quick, clean and simple to empty. The 900’s are equipped with a unique tipper handle. Here you have a big capacity machine; a powerful Structofoam, Twinflo’ two-motor power head, giant shakeable filter system, stainless steel container and heavy-duty transit chassis. Designed to perform well and give good results – year in year out. Be it builder’s rubble, a chicken house or a textile mill, the NTD-2003 will give you good, reliable service. 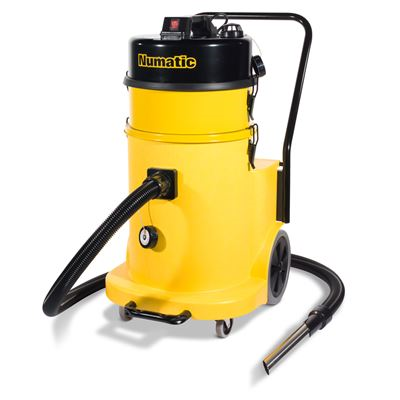 Numatic’s 900 series of “H” specification vacuum machines has been specifically designed to meet the requirements of industries where it is necessary to remove dust that could constitute a health hazard. The power head is of all-steel construction and is available in a choice of one or two motor construction. Power and performance are to full Twinflo’ standards and plugged easily replaceable cable systems are a standard fitment. This machine is available with a Simplex single motor power-head (HZ 900) and 32mm kit or a Duplex twin motor power-head (HZD 900) and a 38mm kit. Suction Unit – The suction is provided by a suction unit of the side channel blower type, with direct coupling between the fan and the motor shaft and no transmission system. It is thus completely maintenance free, fit for round-the-clock 24 hours duty, very silent and provides outstanding suction performances; a safety thermic switch cuts off the motor in case of overheating The control board includes a switch (protection IP55), and a safety emergency stop button. A vacuum indicator enables constant checking of the suction performance, and to detect possible clogging of the filter. Filter Unit – The filter is placed and protected inside the steel filter chamber; the filter is made of polyester, tailored with pockets in order to increase the filter surface (20.000 cm2), and has a high filtration efficiency (3 micron). 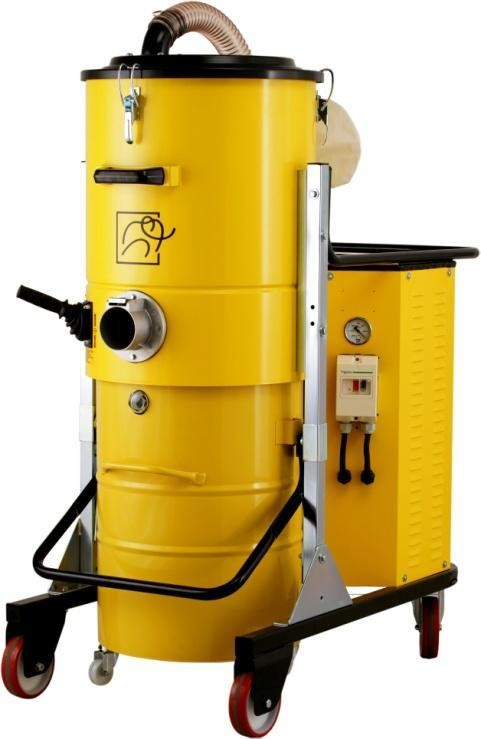 A manual filter shaker enables the user to clean the filter efficiently, by a vertical shaking movement, so as to detach most of the dust and maintain the filter clean, in order to increase its life and maintain the suction performance of the machine. The frontal – aluminium die-cast suction inlet (Ø80 mm. 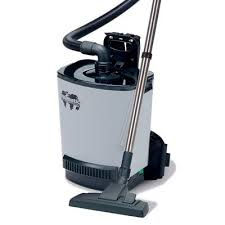 diameter), placed below the filter, makes it possible to vacuum at the same time dust, solid and liquid material (the latter only within the capacity of the container), with no need to change or take out the filter. Collection Unit – The vacuumed material is placed inside a drop-down bin mounted on wheels (100 litres capacity), which makes it possible to dispose easily and safely of the sucked material, if need be collecting it directly into a plastic bag. 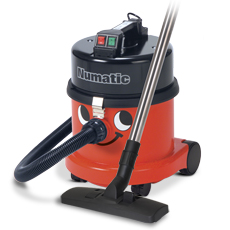 The vacuum is mounted on a sturdy steel chassis with two pivoting wheels, one of which with brakes; all metal parts of the vacuum are epoxy painted.